Owners of unreinforced masonry buildings gathered outside Portland City Hall on Saturday, Jan. 5. Scott Miller feels like a modern-day Hester Prynne. The Portland landlord rents out space to three commercial tenants in a 1.5-story building made of bricks — otherwise known as unreinforced masonry, or URM. His property at Broadway and Northeast 33rd Avenue is one of roughly 1,600 across the city that's required to post outdoor signage warning that the building could be unsafe during a major earthquake. In a nod to the red-lettered protagonist in Nathaniel Hawthorne's classic novel, Miller now has a handmade tag fixed to his vermillion jacket: "URM: You Must Display!" "I think the whole process is flawed and I think they're going after the wrong culprits," Miller said. "I don't want to have to wear a scarlet letter and have people say, 'Oh, he's a slumlord.'" 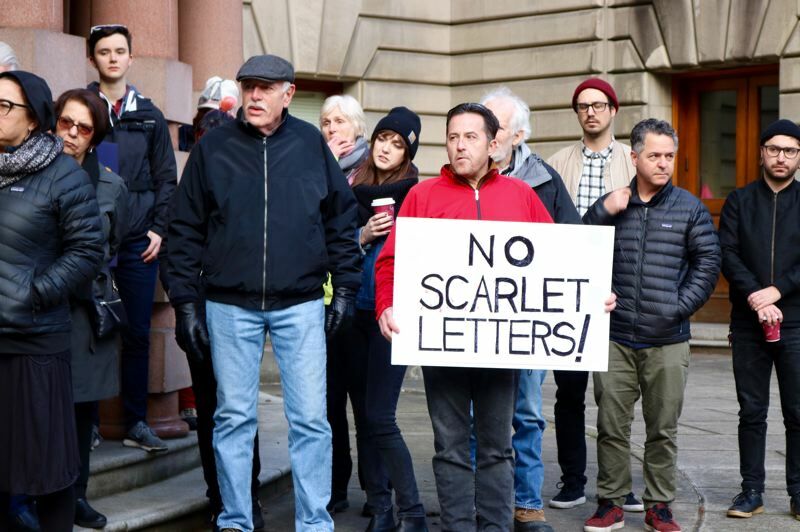 Miller and about 100 others massed outside City Hall on Saturday, Jan. 5 to protest the controversial sign ordinance, which was approved by the City Council on Oct. 10. Private property owners must post the warnings by March 1, while churches and nonprofits have until 2020. The new rules have already provoked a lawsuit on free speech grounds — and have united in opposition some musician advocates and the local chapter of the National Association for the Advancement of Colored People. The Rose City currently hosts about 1,000 live music gigs a month, but about one-third of the city's venues are in the crosshairs because they're held together with bricks and mortar, according to Meara McLaughlin, executive director of MusicPortland. "This is a deathknell," she said, rattling off popular venues that would be impacted, such as the Crystal Ballroom, Kelly's Olympian, Dante's, Keller Auditorium, Holocene, Kells Irish Pub and LaurelThirst Public House. "Do they need to be made safe? Absolutely. But this ordinance does nothing to improve safety." 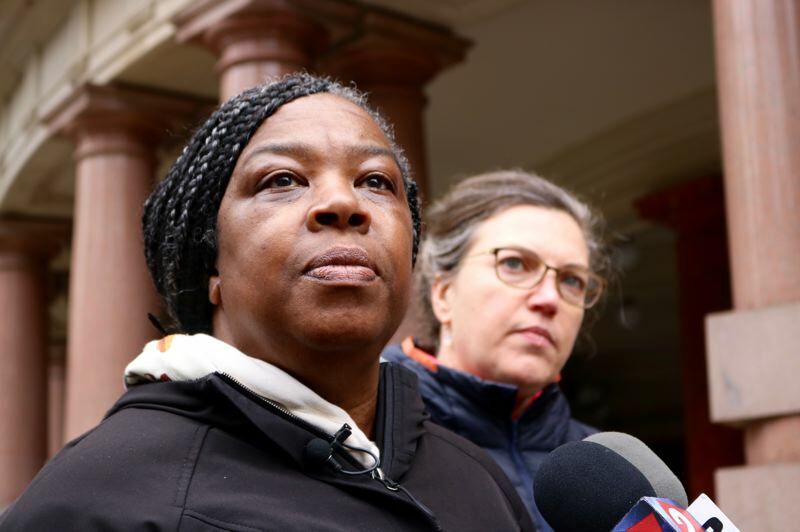 Many who microphoned from the steps of City Hall characterized the new requirements as a "lien" or "encumbrance" on their property, which local officials say is not truly accurate. But Pippa Arend — a co-founder of the homeless youth nonprofit p:ear, who also owns 12 rental units — says she has friends who have been denied refinancing because they're on the city's URM list. Moreover, she says cutting off access to credit will favor out-of-town developers who can afford to purchase URM parcels in cash. "This lien will disproportionately affect our brothers and sisters of color who own buildings," said Arend. "This is redlining." Portland's list of potentially shaky structures includes 45 schools, 35 churches and 270 multi-family complexes providing a total of 6,000 units. Almost all were constructed between 1870 to 1960. City leaders considered mandating these edifices undergo spendy seismic retrofits, but have backed off from that proposal for now due to concerns over cost and the potential for demolition of historic buildings and affordable housing. Virginia Hankins says those upgrades would be ruinous — not just for her, but also for the shopkeepers renting space in her small URM building on Northeast Martin Luther King Jr. Boulevard at Fremont Street. Hankins said it would cost at least $400,000 to upgrade her building. "Financially, my husband and I cannot handle the cost," she said. "Customers are not going to want to come in because they're going to be thinking the buildings will fall down." "We're calling on Mayor Wheeler and the board of commissioners to stop this process now," added the Rev. E.D. 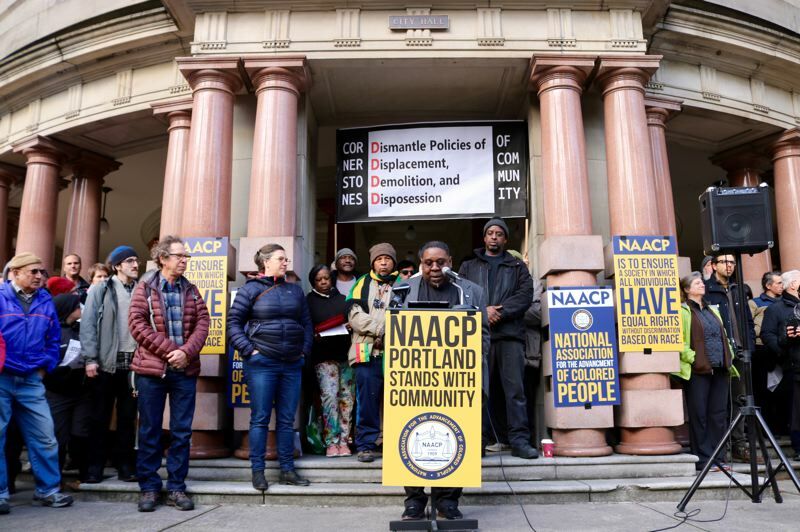 Mondainé, who leads the Portland chapter of the NAACP.